"Pizza in a skillet? You bet . 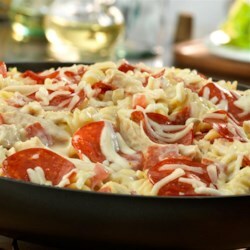 . . cream of mushroom soup, rotini pasta, pepperoni, 2 cheeses, onion, tomato and garlic combine for a creative twist to traditional pizza. It's unbelievably delicious and ready in just 45 minutes." Reserve 14 slices pepperoni. Coarsely chop the remaining pepperoni. Heat the oil in a 12-inch skillet over medium heat. Add the onion, garlic and oregano and cook for 5 minutes or until the onion is tender, stirring occasionally. Stir the soup, milk, Parmesan cheese, 1 cup mozzarella cheese and black pepper in the skillet and heat to a boil. Stir in the chicken, chopped pepperoni, rotini and tomato. Sprinkle with the remaining mozzarella cheese. Reduce the heat to low. Cover and cook until the mixture is hot. Sprinkle with the cheese. Top with the reserved pepperoni slices. Sprinkle with additional chopped tomato, if desired.